Here I'm going to detail a little bit about altering configuration entities, the config entities is a great addition in D8 and does a tons of helpful stuff for developers and site builders. In this example I'm going to alter and add additional configurations in to the Migrate configuration entity. I hope you know what are configuration entities and what are content entities. So in brief Content type is a configuration entity while a piece of content/node is a Content entity. 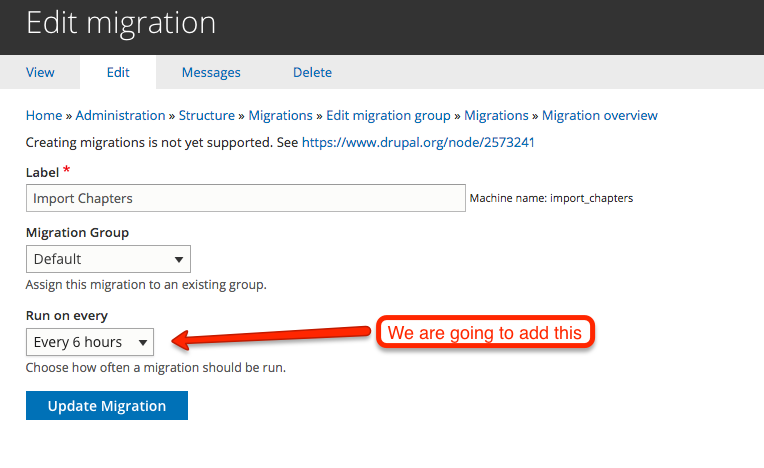 Config entities can be exported using Drupal CEX wizard but content entities can't export. Okay, let's dive in to coding. In this example I'm going to alter Migration Plus contrib modules Migration entity edit page and add additional settings for the form, what we are planning on doing is to add a periodic import on migrations so we can let Migrations run on specific time periods just like Feeds. Let's look at the Migrate configuration file first. # Schema for the configuration files of the Migrate Plus module. * Entity builder for the migration config entity. So that's pretty much it, the only new thing here is #entity_builder and is responsible for mapping data to the entity. Now, install the module or do a cache clear to access your new properties.